#stampinup #faithfulinkspirations Twoday's two-fer is two die for! Ha! We learned the techniques I'm using today at Lydia Fiedler's Unwind Retreat the day before Stampin' Up's OnStage Live event. Lydia is a master masker--it's a quick and fun and effective technique that I never think about trying myself. First, we stamped eight of the bears from the "Pieces & Patterns" stamp set in Basic Black Archival Ink onto masking paper. (Lydia uses Avery Self-Stick Removable Laser ID Labels #6465.) And then we fussy cut each and every one of those eight bears...to some moans and whines, but I LOVE to fussy cut, so I had no complaints!! We used the straight edge of our piece of masking paper to mask the bottom third-ish of a Whisper White panel (I cut mine to 3-3/4" by 5" at home) and then peeled and placed the fussy cut bears onto the top of the panel, randomly. 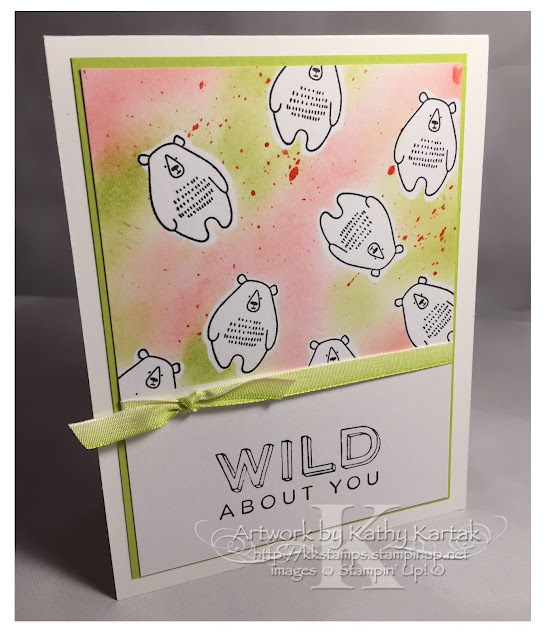 We sponged on some Lemon Lime Twist and Flirty Flamingo Ink and flicked on some Flirty Flamingo Ink, too. When we were finished with that step, we peeled off the bears--saving them for later--and the bottom masking piece. We stamped a sentiment from the "Pieces & Patterns" set in Basic Black Archival Ink onto the bottom of the Whisper White panel. When I got home, I adhered my stamped panel to a 3-7/8" by 5-1/8" Lemon Lime Twist Card Stock mat, wrapped a length of Lemon Lime Twist Ombre ribbon around, and then adhered it to a Thick Whisper White Card Stock card base. How cute is this?! Remember, those bear masks that we set aside? Well, that's where the two-fer comes in! We stamped the "hello there" circle in Basic Gray Ink onto the middle-ish of a Whisper White panel (which I cut to 3-3/4" by 5" when I got home). Then we adhered the bear masks around the circle. Adorbs! Here's Lydia's card and I'm telling you, you need to read her blog post, too. She's brilliant!! When I got home, I adhered my stamp panel to a 3-7/8" by 5-1/8" Flirty Flamingo Card Stock mat and then onto a Thick Whisper White Card Stock card base. Love it!! I've got one more two-fer fer you this week, so come on back and see what else we learned from Lydia!!! I started by stamping the floral image from the "Wood Words" stamp set in Versamark onto a 3-3/4" by 5" piece of Wood Textures Designer Series Paper. 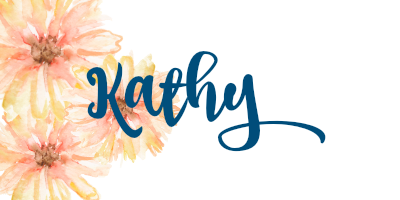 I sprinkled on some Copper Stampin' Emboss Powder and set it with my heat tool. I also stamped "thank you" from this set in Versamark onto a Very Vanilla scrap, used Copper Stampin' Emboss Powder, and heat set it. I cut out the heart with one of the Wood Crate Framelits. I adhered this piece to a 3-7/8" by 5-1/8" piece of Lemon Lime Twist Card Stock and then onto an Early Espresso Card Stock card base. On the inside of the card (not shown), I adhered a 3-3/4" by 5" piece of Crumb Cake Card Stock to a 3-7/8" by 5-1/8" piece of Lemon Lime Twist Card Stock. Next, I cut out two Lemon Lime Twist and two Crumb Cake leaf pieces with one of the Rose Garden Thinlits. I also cut a small Crumb Cake circle with the smallest circle from the Stitched Shapes Framelits. I adhered the ends of the leaves directly to the card with some strategically placed Snail Adhesive and I used the Fine-Tip Glue Pen to adhere some of the leaves to the card--some of the leaves are allowed to "pop" off the card without being glued down. I cut two 4" pieces of 1/4" Copper Trim and spread out the edges so that it's wider. I adhered the ends of each piece to the center of the card with some more Snail Adhesive. I adhered the heart to the stitched circle and then adhered this piece to the card with three Stampin' Dimensionals. This card is so shiny in real life. Here's another view so you can get the drift, but it's much better in person! I just love that Lemon Lime Twist with Early Espresso--well, to tell the truth: I love Lemon Lime Twist with just about everything! !